If you regularly read financial periodicals, you will come across articles from financial experts on doomsday scenarios. Many times they are motivational pieces focused on selling you something to “protect” you against the awaiting catastrophe; other times it is a true warning by an expert that sees something very disturbing. The Dotcom Bust, the Asian Currency Crisis and even our 2008 Real Estate Bubble all had warning signs and experts who correctly predicted the financial disaster. Today’s popular pending Armageddons are the Student Loan Bubble, the T-Bill Bubble and in the real estate sector a warning about Equity Lines of Credit (ELOC). If you were a homeowner in 2004 – 2008 you were receiving multiple free offers for ELOC with low payments and teaser rates. Many homeowners took advantage of those freebies and started using their home equity like credit cards to buy everything from automobiles to vacations. In hindsight these mortgage instruments have been pretty good deals. 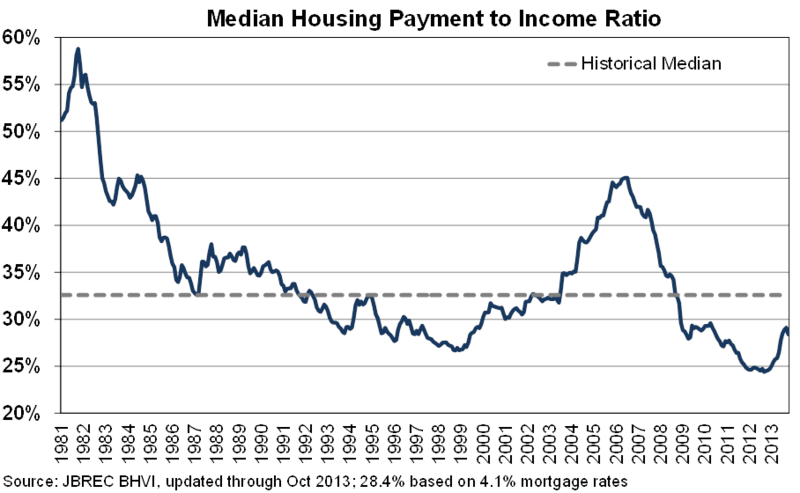 Historic low-interest rates over the last 5 years and the tax benefits associated with the ELOCs have made this a very cheap method to finance any purchase. Unfortunately, most homeowners do not understand the mechanics of their ELOC. Many times the promissory note they signed ten years ago was never read, explained or maybe just forgotten. A quick explanation of how an ELOC works will help you understand the time bomb lurking in the shadows. 98% of all ELOC have a 10 year draw period. During this time you can use your line like a credit card to buy goods and services. After the 10th year starts the 20 year repayment period begins (a few ELOCs have 15 year repayment periods). All ELOC have an index and most are based on the prime rate (currently 3.25%). Lenders use an index to make sure that they receive an interest rate that is commensurate with current market conditions. To the index rate the lender adds a margin (the Bank’s profit) usually 0.0% to as high as 3.0% or more. Check your Promissory Note or with your servicer to find your margin. Every month the lender adds the index rate to the margin and divides by 12. This is the monthly rate you are charged on your outstanding balance. These loans do not contain any sort of periodic cap to protect you from quick interest rate increases month over month. A lifetime interest rate cap of 18% is standard. Please do not misconstrue that I am predicting an 8.25% prime rate anytime soon, but recognize that homeowners who have ELOC s with larger balances need to be aware of potential payment increases and how it could affect them. If I can help you figure out how your ELOC will adjust and the steps you can take to minimize the impact please call me at my office. 310 540 1330. Being in the Real Estate industry gives me access to various tools, reports and statistics that most individuals cannot find. That being said you can find a chart or statistic to make a case for or against almost anything. The big question on many of my client’s mind is where Real Estate prices go from here. Our friends at John Burns Real Estate Consulting do a marvelous job of sifting through the numbers on a state by state and county by county level to come up with relevant, timely and meaningful predictions about matters in real estate. I found the recent information prepared by JBREC to be extremely interesting as it charts the historical ratio between the median housing payments to income. A shorter way of describing this chart is an affordability ratio. As home payments get more expensive via higher rates, median home prices or a drop in income it is reasonable to expect a reversal in demand. The historical mean of the average housing payment to income ratio is close to 32.5%. The current ratio through October 2013 is 28.4% based on a 4.1% 30 year fixed rate. If this chart holds true we would need another 13% increase in the national sales price or mortgage rates to go to 6% before we hit the historical mean of 32.5% in affordability. Please call me to discuss your plans in purchasing a home or Real Estate investment in 2014. Unless you are paying cash, getting all your ducks in a row early will save you time, money and headaches! The frenzied atmosphere of this summer’s home buying season created conditions in which buyers had to make tough decisions on paying over value, waiving inspections, waiving appraisal contingencies and other contractual milestones that protect them from potentially harmful financial situations. For those who are still looking to purchase a home and were frustrated by the absolute chaos of multiple offer and “bidding war” situations during the summer months, may take hope in the recent slow down in activity. Supply and demand is a basic driver of price in any free market and the lack of homes for sale has continued to be an issue (See Chart). Just a short 16 months ago a home owner wanting to sell his property had a tough time getting a fair price for his property because of the glut of foreclosures and short sales that were his competition. That is no longer a problem as distressed sales in the South Bay and the nation as a whole, have dramatically decreased. According to most experts the supply of homes for sale will probably not increase any time soon (Foreclosure Rates). Demand from home buyers while still strong, seems to have slowed a fraction. To blame could be seasonal issues along with higher interest rates and sales prices. The latest Homeowners Affordability Index (HAI) report from the California Association of Realtors (CAR) showed that affordability in California has slipped every quarter since it’s high in the first quarter of 2012. Mortgage applications for purchases as reported by the Mortgage Bankers Association, a very reliable forward looking indicator for home sales has also fallen almost every week since the September 22, 2013 release. 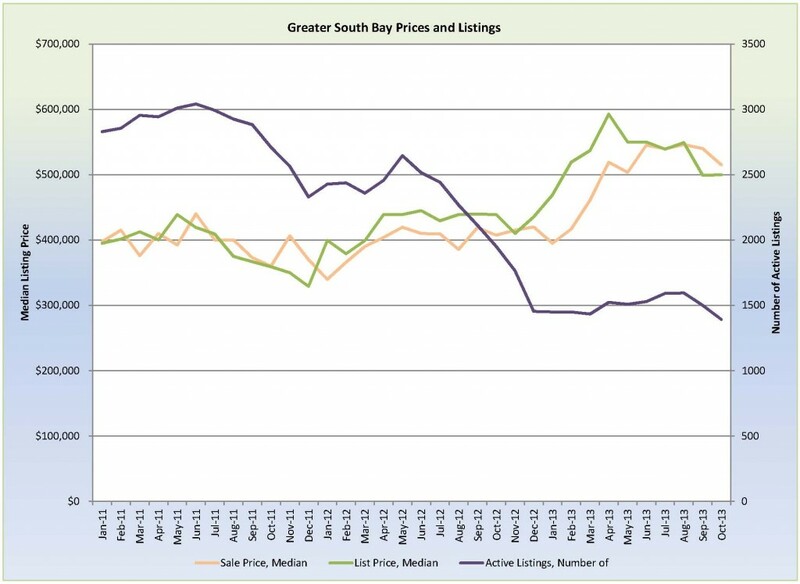 Current conditions for buying a home appear as favorable now as they were in the 2nd quarter of 2012. 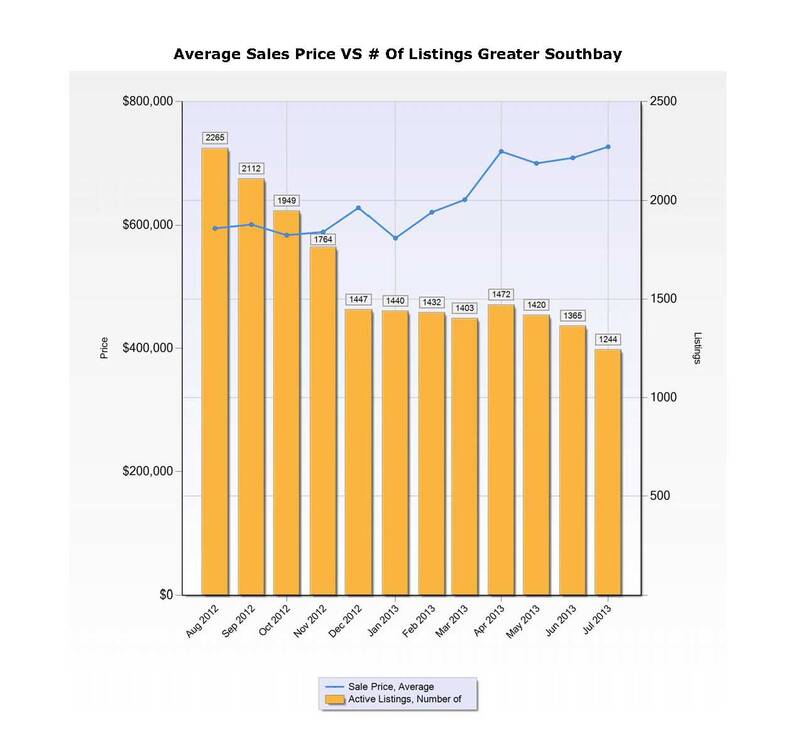 Rates are still a extremely low historical levels and while we are still in a seller’s market buyers are not running over each other at the site of a new house on the market. At least until Spring buying season 2014, buyers should be able to make rational decisions based on real issues and not the “if I don’t get this one, I’ll miss the market” mentality. Please let me know if i can be a resource you you or your acquaintances on any matters of real estate. Through financial news reports and various investment magazines I have been made aware of a coming moment in time somewhere in the future when the Federal Reserve will have to make an important decision to do something about their Quantitative Easing Program. Well many believe we are on the eve of this great day in the upcoming September 18th Fed meeting. Just the mere mention of slowing the program down by Federal Reserve Chairman Ben Bernanke has sent the fixed income market into turmoil since May 22nd. The program’s name itself “Quantitative Easing”, sounds safe enough and does not conjure up any visions of impending doom but the manner in which the Fed “unwinds” the program could have major ramifications. Because the Fed indirectly controls interest rates for credit cards, cars, business and home loans it also has a big influence on the well being of our and the world economies. The link below will take you to a speech given by President Richard W. Fisher of the Federal Reserve Bank of Dallas and voting member of the Federal Reserve of the United States, that in my opinion is the best and most simple explanation of what the Fed has done and now must do. It clearly explains and depicts with charts the monumental task that faces the Federal Reserve over the next few months and years. If I can be resource to you, your family or friends on any matters of Real Estate, I would be honored to help. I can be reached in my office at 310 540-1330.